The aim is for all Fairlawn children to be confident and enthusiastic speakers, readers and writers, so we provide a broad range of daily activities for children to develop and apply their speaking, listening, reading and writing skills. Included in this provision are opportunities for public-speaking and drama activities and reading and writing in different styles and for different purposes. 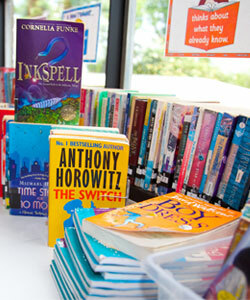 A home reading scheme is operated from reception through to Year 6, whereby children bring home books to share with their families each week. As well as fostering reading, this gives the school and parents a regular way of communicating about their child’s reading. Instilling a love of reading is a really important aim of our reading curriculum, so children do get opportunities throughout the week to read for pleasure. We teach phonics in EYFS and KS1 using the Letters and Sounds programme. You can view the document here. Some children in KS2 also benefit from phonics teaching throughout the week. The use of engaging, relevant and high quality texts is central to our writing curriculum. These act as stimuli for children to develop and explore their writing skills. Children write for purpose wherever possible, on a theme linked to the half termly topic. The teaching of writing follows 5 phases. Phase 1) Cold Write: The children write a piece based on the genre they will be learning about. This is unaided and without input. This allows the teacher to plan the learning from the children’s starting points. Phase 2) Immersion and ‘Have a go’ writing opportunities: This phase is about immersion in the text type. This is a crucial phase in the teaching of writing. The idea is to let the children see what a good one looks like. They need to pull this apart (not just language features but also thinking about text level objectives too). The learning wall will be used to display key learning from this stage. This phase may involve drama opportunities and short ‘Have a go’ writing opportunities (note taking, diary entries, character profiles etc). Phase 3) Writing opportunities – building towards a writing outcome: Phase 3 will offer more ‘Have a go’ writing, but will also be preparing the children for their final written outcome. There may be a mixture of short writing outcomes and extended writing outcomes. Phase 4) The final written outcome: Throughout this phase, the writing journey is scaffolded by modelling and shared writing. The children will have weekly spellings sent home to learn. These will consist of words from the National Curriculum statutory word list, as well as words that are commonly misspelt in their writing. Some words will follow a spelling rule – get children to explore these rules. At Fairlawn, children are encouraged to use a cursive script from Foundation Stage. Please see our Literacy Policy for more details.